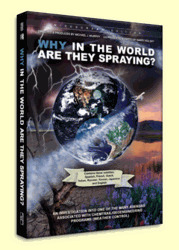 DVD: What in the World Are They Spraying? By now everyone has seen crisscrossing streaks of white clouds trailing behind jet aircraft, stretching from horizon to horizon, eventually turning the sky into a murky haze. Our innate intelligence tells us these are not mere vapor trails from jet engines, but no one yet has probed the questions: who is doing this and why. With the release of this video, all of that has changed. Here is the story of a rapidly developing industry called geo-engineering, driven by scientists, corporations, and governments intent on changing global climate, controlling the weather, and altering the chemical composition of soil and water  all supposedly for the betterment of mankind. Although officials insist that these programs are only in the discussion phase, evidence is abundant that they have been underway since about 1990  and the effect has been devastating to crops, wildlife, and human health. We are being sprayed with toxic substances without our consent and, to add insult to injury, they are lying to us about it. Do not watch this documentary if you have high blood pressure.